In one sense it can be said that our program activity began in 1972 in Kuiper’s Atlanta ITC office, as Bernard argued successfully that the five of us needed to act. Not that much argument was required, though. Three of us, Kuiper, Lund, and myself, had completed our doctorates working with targumic material under Matthew Black’s supervision at St. Andrews and had already been convinced by him of the importance of getting them into print, while Shirley had inspired her former Boston University graduate school colleague Julia with enthusiasm for the targumim and admiration for Black such that their friendship had made her a welcomed member of our informal alumni group. 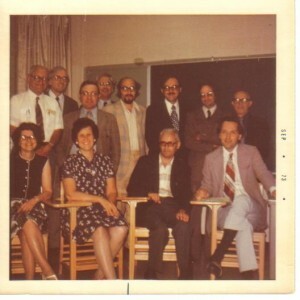 As Bernard was sure his colleague Moses Aberbach at Baltimore Hebrew College could arrange to host a general meeting, the five of us agreed that we should form an Association for Targumic Studies and that he and Aberbach would organize a gathering whenever it could be scheduled. Furthermore, it was noted that the late Roger Le Déaut of the Pontifical Institute was in Pittsburgh and should be invited to speak. We committed ourselves to supporting whatever Bernard was able to work out at Baltimore Hebrew and to sharing information about it to as wide an audience as possible. The next step in our journey occurred again in Atlanta, but this time at the Spring, 1973, joint meeting of the Southern Sections of the SBL and AAR. George MacRae, who had succeeded Bob Funk as SBL Executive Secretary, was attending the meeting to work with Leander Keck, our Section President, to finalize plans for the upcoming SBL Annual Meeting, for which they asked me to submit a request to both the SBL Program Committee and its Committee on Research and Publication for the scheduling of a Consultation on matters Targumic. They involved me because I had recently been elected to my third term as Secretary of the Southern Region and they knew me. That was in the day when there were only a half-dozen or so geographical regions whose secretaries all served on the Council of the Society. Of course, with the increase in the number of SBL regions, that is no longer the case. But it was then. I did submit such a request and it was approved in time to plan for the Annual Meeting. But to return to the summer calendar: in due course, Bernard informed us that he and Aberbach had reserved Baltimore Hebrew College for the weekend of June 13–14, 1973. At the appointed time, we headed to Baltimore with no idea of the response, and were thrilled to welcome some twenty-five or so interested scholars, especially about a half-dozen who accompanied the late Ernest G. Clarke from the University of Toronto. Le Déaut was there to inspire all of us, the possibility of a SBL Targum Program Segment excited us, and we concluded the meeting with the decisions both to inaugurate a society committed to the publication and study of the Targumim and to initiate a newsletter devoted to the subject. A group photograph of a dozen of us taken by Toronto attendee Douglas Fox is appended to this paper. We might say that our program activity began here, as this meeting almost guaranteed attendance at the upcoming SBL Consultation. We called the society the Association for Targumic Studies, with an Executive Council consisting of Walter E. Aufrecht from McMaster’s, Ernest G. Clarke from Toronto, Julia A. Foster from Pfeiffer, Charles T. Fritsch from Princeton, Bernard Grossfeld from U. of Wisconsin in Milwaukee, Gerard J. Kuiper from ITC in Atlanta, Shirley Lund from Boston University, Bruce J. Malina from Creighton, with myself from St. Andrews Presbyterian College as the Chair. The publication we called the Newsletter for Targum Studies, to be published three times a year, with its first issue to appear in January, 1974, under the editorship of Wally Aufrecht and with a Steering Committee of Ernie Clarke, Shirley Lund, Bernard Grossfeld, again with me as the Chair. The joint AAR/SBL Annual Meeting rolled around in late November, 1973, and our Consultation was successful. Many of our Baltimore attendees showed up bringing their colleagues as well. Le Déaut again was able to be present, although our getting him there as a speaker created some consternation within the SBL bureaucracy plus criticism of us for not receiving approval for scheduling a presentation by a visiting scholar. Le Déaut’s talk was subsequently published in the Biblical Theology Bulletin with the title “The Current State of Targumic Studies.” ((Roger Le Déaut, “The Current State of Targumic Studies;” Biblical Theology Bulletin, IV , 3–32.)) Again, one could argue that the success of this Consultation marked the beginning of our program activity. In my opinion, the key person in all our activities to this point was Ernie Clarke, who as the only full professor and established authority in our discipline gave us the gravitas necessary for wider acceptance. His importance became evident soon after that SBL meeting when he received word that several Israeli scholars, notably Moshe Goshen-Gottstein, Jacob Milgrom [in Israel from UC-Berkeley for a visit], and I think Emanuel Tov, as well, were concerned about unknown figures who appeared to be trying to establish control of Targumic Studies. Ernie informed me that Goshen-Gottstein planned to attend the upcoming Edinburgh meeting of the International Organization for the Study of the Old Testament [IOSOT], as was he, and that I needed to attend as well. As I look back on that time, I realize how concerned Milgrom and his friends must have been. Jacob Milgrom had been Rabbi at Temple Beth-El in my hometown of Richmond, VA, during my student days. Although my family were and are Presbyterians, my father admired Milgrom, attended a number of bar-mitzvah services at Temple Beth-El with attorney colleagues, and actually borrowed a Hebrew-English Bible from Milgrom and the synagogue for my student use. As you must be aware, the surname Doubles is not a common name, and I now understand how completely puzzled Milgrom must have been when he saw my name associated in such varied ways with this enterprise and began to make the connection with his earlier days in Richmond. I can see why such senior scholars might wonder who these newcomer whipper-snappers were and what they were trying to do: with a chairman named Doubles, it cannot be serious! Ernie and I did get to Edinburgh together with our wives, whose presence turned out to be a most important addition. Rachel Goshen-Gottstein had accompanied her husband and the wives became friendly, shopping and enjoying Edinburgh Festival activities together. I think the women reached the decision that their husbands were going to cooperate! In any event, our negotiations proved fruitful, we ended on a first-name friendly basis, and Moshe Goshen-Gottstein accepted membership on the Editorial Board of the Newsletter for Targum Studies. And these were heady times. The Xerox dry-copier had made carbon and onion skin paper obsolete, to everyone’s delight. More importantly, however, mainframe computers had become accessible as a support for scholarly enterprises, and we were all learning Fortran or another programing language along with how to manage key-punch machines and their readers. I can still remember the excitement associated with the realization that one word could be changed without the re-typing of an entire page! Printers were basically mechanical typewriters, however, posing a challenge for those of us interested in the printing of material in square-block Hebrew lettering. On the other hand, at St. Andrews College, my friend Bill Rolland, the physicist who managed the computer operation, stated that if I would give him three Hebrew typewriters like the one I owned he would make us a printer and we would be home free! The College had a dedicated line linking its card-reader and printer to the mainframe at the North Carolina Research Triangle and the addition of another printer would have been no problem. This led to the creation of what we called “The St. Andrews Publication and Research Center” and to attempts by the college’s Development Office to locate funding for such an enterprise. For a brief moment, it appeared as if the St. Andrews in North Carolina would become a center of scholarship in our discipline like its Scottish progenitor, but that was not to be, and for two principal reasons. For one, the Development Office and I were unsuccessful in several attempts to find money to support such a venture. Even more important, however, was the appearance of the dot-matrix printer, followed by the jet and laser printer, whereby the printed font became the province of software and no longer hardware alone. Bill Rolland’s mechanical Hebrew-letter printer became obsolete even before it was built, and that was that. The rapid dissemination soon after of the desktop computer attached to its individual printer added the final nail sealing that coffin. To return to the SBL, however, I chaired a second Consultation on Targumic Studies at the October, 1974, SBL meeting. Ernie Clarke reported on “Targumic Studies at the 8th International Congress of Old Testament Studies,” including the invitation to our newly-created Association to plan a Targumic Studies program for the 9th Congress three years hence in Germany. It should be added that, for all practical purposes, this meant Ernie, as he was the only one of us with sufficient seniority and a large-enough budget to attend the IOSOT meetings. The second part of the program was my report on “The St. Andrews Publication and Research Center.” These reports were followed by a very positive discussion of the proposal to organize a new annual program segment on Targumic Studies and an Association meeting was scheduled for March 21–23, 1975, in Atlanta. As the SBL Council decided that two such successful Consultations clearly indicated the need for a program segment, I suppose it can be said that this marked the official beginning of our program activity. But back to our subject. Our official beginning was with the first regularly scheduled SBL program section which appeared in October, 1975, when Bruce Malina chaired a Targum Studies segment offering papers from five people: Jose Faur, Bernard Grossfeld, Julia Foster, Moise Ohana, and myself. In addition, Moses Aberbach, Oliver Howard, and Michael Silverman presented Targum-related papers as a part of the program of the Ancient Epistolography Group. Space limitations in St. Louis precluded the SBL Targum segment from being held in 1976, but in November of that same year the first colloquium in North America claimed by the sponsors to be devoted solely to Aramaic studies was hosted by the Oriental Institute of the University of Chicago. The SBL Targum Studies program segment was continued under the chair of Bruce Malina in 1977, who was succeeded in 1979 as our Program Leader by Julia Foster, who had to announce almost immediately that due to space limitations associated with the SBL Centennial Meeting in Dallas, the Targum Studies section would not meet in 1980, but would be resumed in 1981. Julia continued as the Program Chair until the 1983 meeting, when she proposed the expanded name-change to Aramaic Studies and in 1984 our current SBL program segment began under the chairmanship of Ernie Clarke. As for the Newsletter, which is still published albeit in electronic form, beginning in 1976 the name of the publication became the Newsletter for Targumic and Cognate Studies, and J. D. Whitehead of Waterloo (Ontario) accepted the position of Associate Editor, working with Wally Aufrecht who continued as Editor. In other matters, a new Constitution for the Association for Targumic Studies was adopted November 20, 1978, at the New Orleans SBL meeting. At that same meeting, I resigned my positions because of the increased administrative responsibilities associated with my move from St. Andrews to the position of Provost at Coker College, with Shirley Lund being elected to succeed me as President of the Association and Michael Klein assuming a position on the Newsletter Steering Committee as well as direction of Fragment Targum publication, leading to his 1980 two-volume presentation of these texts. ((Michael L. Klein, The Fragment-Targums of the Pentateuch [2 vols]; Rome: Biblical Institute Press, 1980.)) Sometime later, Ben Viviano succeeded Wally as editor of the Newsletter, while The Association for Targumic Studies was officially discontinued in 1983 as no longer necessary, all of its activities being under the effective sponsorship of other groups. Let me conclude by thanking you for your interest, and once again call to your attention the important role played in our origins by Bernard Grossfeld and Ernie Clarke, the former for his initial idea and the latter for his wisdom guiding us through the first decade of our existence. To them and to all involved in those early years we owe a debt of gratitude for providing a structure to support the continuing development of our discipline. This entry was posted in Aramaic, NTCS, SBL and tagged Aramaic Studies, NTCS, SBL by admin. Bookmark the permalink.